If I had to pick one word to describe HQ Raleigh, it would be collaboration. HQ Raleigh is a co-working space in downtown Raleigh&apos;s Warehouse District for entrepreneurs and start-ups. 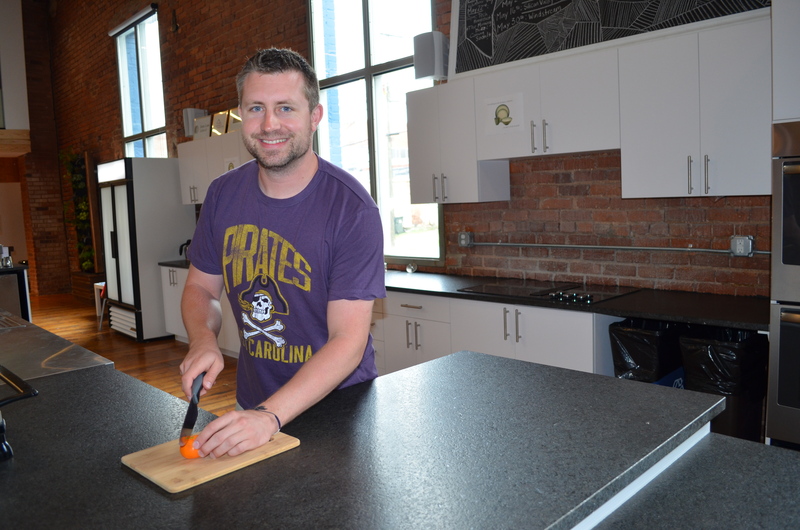 Will Hardison of Fanbase recently moved his business into HQ Raleigh&apos;s office space, and being surrounded by like-minded thinkers inspired him to launch a new concept, ideATE. Will Hardison has toyed with the idea of opening his own restaurant and he hopes ideATE will give him a taste of the restaurant industry. ideATE is an old-school, soda fountain concept and represents a collaboration of ideas and people, which fits into HQ Raleigh&apos;s mission. ideATE will happen each month in conjunction with First Friday. If you love Motown music, milkshakes and a juicy burger, come out to ideATE&apos;s launch today from 6-8pm. ideATE is a family-friendly event open to all Raleigh residents and visitors. Will has teamed up with a local chef, Mike Santos, to design a menu with something for everyone&apos;s palate. Will&apos;s old band used to play at Mike&apos;s restaurant in Greenville, N.C., Chefs 505. Mike left the restaurant to become a personal chef and instructor at The Chefs Academy in Morrisville, N.C. The menu for ideATE will please everyone with options changing each month. Chef Mike and Will have decided to keep the menu simple while adding a special twist to classic grilled cheese sandwiches, hot dogs and burgers. Food cost is on a donation basis with the suggested donation for an entree, side and soft drink being $6 and specialty drinks and desserts being $3. Choose from Plain Jane-style burgers and hotdogs or kick things up a notch with chef Mike&apos;s creations. I&apos;m anxious to try the Holy Chow! Barbecue Burger. This home made chow chow burger will feature smoked Gouda cheese or cheddar cheese along with caramelized onions, lettuce, tomato and barbecue sauce. There area also vegetarian options like the fried green tomato grilled cheese, which will have a kick from a spicy jalapeno pimento cheese. If you have a sweet tooth, don&apos;t miss ideATE&apos;s desserts. Mama Fuquay&apos;s chocolate chess pie is sure to be a delicious option. Will&apos;s mom Debra will be featuring slices of her decadent pie. Going along with the old-school soda fountain theme, there will also be malted floats, strawberry milkshakes and root beer floats. So, grab a milkshake and dance along to the Motown music today. In the future, ideATE would like to form partnerships with local organizations. For instance, they hope to partner with Raleigh City Farm to exemplify the local farm to fork movement. I&apos;m excited for this new Foodie concept to launch on Fri. Make sure to place your orders online or get to ideATE early with your friends and family.